Spock is the prefered CLI for sardana. It is based on IPython. 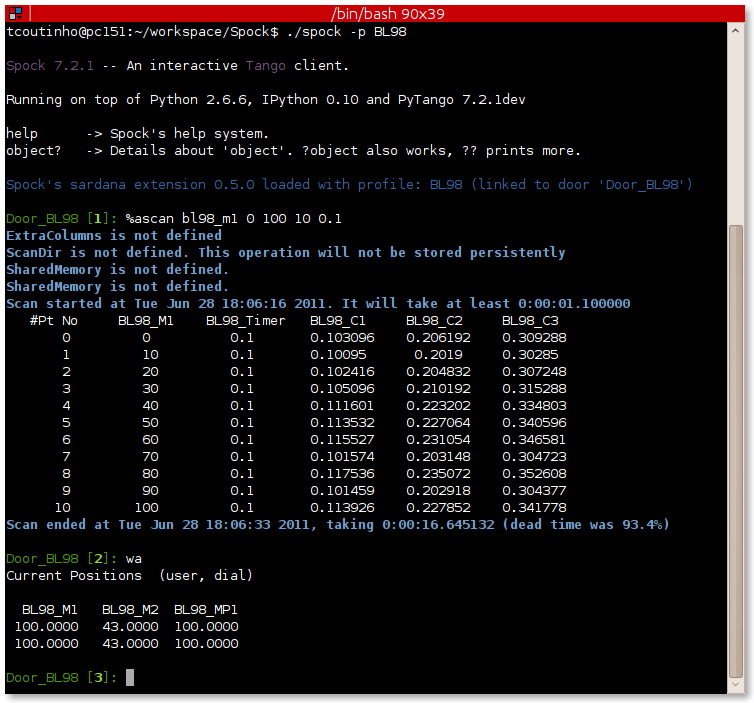 Spock automatically loads other IPython extensions like the ones for PyTango and pylab. It as been extended in sardana to provide a customized interface for executing macros and automatic access to sardana elements. Spock tries to mimic SPEC‘s command line interface. Most SPEC commands are available from spock console. Profile 'spockdoor' does not exist. Do you want to create one now ([y]/n)? If only one Door exists in the entire system, spock will automatically connect to that door thus avoiding the previous questions. Spock 7.2.1 -- An interactive sardana client. help      -> Spock's help system. spock allows each user to start a spock session with different configurations (known in spock as profiles). All you have to do is start spock with the profile name as an option. The first time a certain profile is used you will be asked to which door you want to connect to (see previous chapter). Spock profiles are stored by default in ~/.ipython/profile_<profile_name> directory. For more information please refer to the IPython documentation. lsmac        expert                                            Lists all macros. wa      standard                                     Show all motor position. wm      standard                   Show the position of the specified motors. lsm shows the list of motors. lsct shows the list of counters. Some macros may take a long time to execute. To stop a macro in the middle of its execution type Control+c. Macros that move motors or acquire data from sensors will automatically stop all motion and/or all acquisition. To exit spock type Control+d or exit() inside a spock console. Do an absolute scan of the specified motor. position given by start_pos and ends at the position given by final_pos. specifies seconds and if negative, specifies monitor counts. will move the gap motor to 50. The prompt only comes back after the motion as finished. Alternatively, you can have the motor position displayed on the screen as it is moving by using the umv macro instead. To stop the motor(s) before they have finished moving, type Control+c. will move gap by two user units. You can count using the ct value macro. Without arguments, this macro counts for one second using the active measurement group set by the environment variable ActiveMntGrp. to switch active measurement groups type senv ActiveMntGrp mg_name. Sardana provides a catalog of different standard scan macros. Absolute-position motor scans such as ascan, a2scan and a3scan move one, two or three motors at a time. Relative-position motor scans are dscan, d2scan and d3scan. The relative-position scans all return the motors to their starting positions after the last point. Two motors can be scanned over a grid of points using the mesh scan. Continuous versions exist of many of the standard scan macros (e.g. ascanc, d3scanc, meshc,...). The continuous scans differ from their standard counterparts (also known as step scans) in that the data acquisition is done without stopping the motors. Continuous scans are generally faster but less precise than step scans, and some details must be considered (see Scans). As it happens with ct, the scan macros will also use the active measurement group to decide which experiment channels will be involved in the operation. Sardana will activate a proper recorder to store the scans persistently (currently, .h5 will store in NeXus format. All other extensions are interpreted as SPEC format). LAB-01-D01 : senv ScanFile "['scans.h5', 'scans.dat']"
Sardana provides also a scan data viewer for scans which were stored in a NeXus file: Showscan. It can be launched using showscan spock command. It accepts scan number as an argument, and will show the last scan when invoked without arguments. 1    dscan mot01 20.0 30.0 10 0.1   2012-07-03 10:35:30   2012-07-03 10:35:30   Not stored! 3    dscan mot01 20.0 30.0 10 0.1   2012-07-03 10:36:38   2012-07-03 10:36:43   Not stored! 4   ascan gap01 10.0 100.0 20 1.0              12:56:47              12:57:18   Not stored! The View Options allow the users to customize the output displayed by certain macros. They are set by the macro setvo. The macro usetvo returns the View Options to the default value. And the macro lsvo lists the current values. ShowDial: Select if the dial information of the motor should be displayed. Default value False (no dial but only user information). ShowCtrlAxis: Select if the name of the controller the motor belongs to should be displayed. Default value False (no controller name). PosFormat: Set the number of decimal digits displayed in the motor position/limits. Default value -1 (all digits). OutputBlock: Set if the line information during scans is appended to the output or updated. Default value False (lines are appended to the displayed output during the scan). The command edmac allows to edit the macros directly from spock. See Writing macros section. Spock provides some commands that help to debug or recognize the errors in case a macro fails when being executed. debug used with on as parameter activates the print out of the debug messages during macro execution. Set it to off to deactivate it. post_mortem prints the current logger messages. If no argument is specified it reads the debug stream. Valid values are output, critical, error, warning, info, debug and result. Spock syntax is used to execute macros. It is based on space separated list of parameter values. If the string parameter values contain spaces itself these must be enclosed in quotes, either single quotes '' or double quotes "". The spock syntax was extended with the use of square brackets  for macros which define repeat parameters as arguments. Repeat parameter values must be enclosed in square brackets. If the repeat parameter is composed from more than one internal parameter its every repetition must be enclosed in another square brackets as well. """Execute move with a timeout"""
However for the commodity reasons the square brackets may be skipped. The following examples explain in which cases. When the repeat parameter is the last one in the parameters definition both square brackets (for the repeat parameter and for the repetition) may be skipped. When the repeat parameter contains only one internal parameter the square brackets for the repetition must be skipped. When the repeat parameter contains only one internal parameter and you would like to pass only one repetition value then the square brackets for the repeat parameter may be skipped as well resulting in no square brackets being used. A set of macro examples defining complex repeat parameters can be found in Macro parameter examples. You can see the invocation example for each of these macros in its docstring.